First off - you can skip setting up a server. Now, I know that may sound crazy. I use ColdFusion everywhere. Most of us have a web server we can use. But having an ad hoc back end system for your mobile apps is a powerful incentive. Parse has full SDKs for Android and iOS, but even better, they've got a URL based API. You can use this API to create, update, delete, and search your data. Just to reiterate to make sure this is clear - your mobile applications can make use of a dynamic database without any setup on your web server. Just sign up, get your keys, and get cranking. Even better, they provide some real good benefits on top of what I already said. 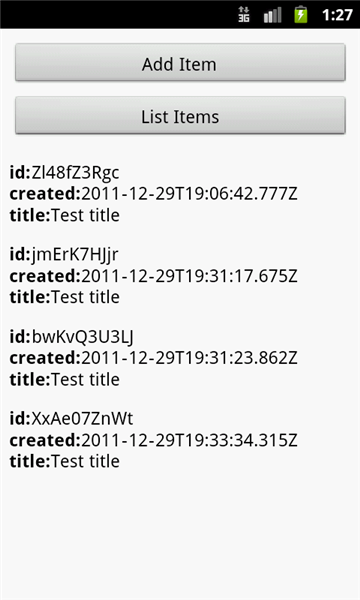 First - any objects you create will have metadata (date+ID) added to them automatically. Yeah you could do that yourself, but it's a handy addition. Second - they have special support for users. Basically, they recognize that user objects are probably something almost every application has, so they go out of their way to handle them better and make it part of your model. You can read more about their REST API here. I decided to give their API a try with PhoneGap and jQuery. While Parse is a paid service, they do offer a free version in their pricing plans. Hitting their API with jQuery proved to be a bit difficult. You need to include a username and password (which corresponds with two of your keys). That parts easy enough if you use $.ajax. What proved more difficult was the Authorization header. This header needs to be the combination of the username/password strings and has to be Base64 encoded. In this case, I'm adding an object by doing a POST. Notice how I can just make a note object, serialize it, and send it. I love that. You get a JSON object back containing the ID of the new object. How about listing objects? Note that the significant change here was from POST to GET. It's as simple as that. I can then loop over my results and display them how I choose. Note that they support both pagination and getting the total number of results too. As I said, I think this is an incredibly impressive service. The only negative I can see so far is that it seems a bit slow, but, I only tested with the Android Emulator, and that tends to make everything look a bit slow. I've yet to test it on a real device over WiFi yet. Also - note that their REST API will also work great with your server applications. Now, I know I just said you don't need a server, but if you want to offload data storage and traffic to Parse, you can use another server to handle things like reporting or management. I tried calling Parse via ColdFusion and it worked well. Looking for a ColdFusion job?